We continue our World Cup analysis by discussing Day 3 of the group stages, covering Argentina’s disappointing first match and Denmark’s win over Peru. Iceland shocked Argentina to earn a draw in their first ever World Cup match, a staggering achievement for a nation with a population 45 times smaller than that of Buenos Aires. Iceland defended in a very deep and compact 4-4-2 defensive block, shutting out Argentina from the centre of the pitch. Once the ball had been won, Iceland counter-attacked against Argentina whilst their defence was in a disorganised state in defensive transition. Argentina lined up using 4-2-3-1, one of Sampaoli’s most commonly used systems whilst managing Argentina, which moved into more of a 2-3-3-1-1 in possession. There were a couple of surprise team selections. Mascherano started centre-midfield, after many thought he would start alongside Otamendi at centre-back, where Rojo was selected instead. Meza started in the right-wing/inside-playmaker role, in place of what would have been Lanzini if it wasn’t for his injury last week. As expected, Argentina dominated possession, and with the majority of the match being played inside Iceland’s half. Argentina’s attacking structure was extremely fluid, even more so than usual, which was perhaps implemented by Sampaoli to aid the manipulation of Iceland’s defence to break through their compact block. The fluid interchanging movements between Argentina players was executed by almost all of their players. One of the most common cases of this was the movement of Messi in relation to his teammates, and his teammates’ movement in relation to him. Sometimes Messi would appear in the right half-space, which was complemented by Meza moving into a central position, with Salvio occupying the wing channel. On other occasions, Salvio would dribble inside into the right half-space, meaning Meza occupied the wing channel, with Messi in a central #10 position. Messi consistently found intelligent spaces between Icelandic defenders, and is perhaps the best player in the world at finding space in opposing defences by hardly moving. However, upon receiving the ball, he had an extremely limited amount of space to operate in. He dribbled past two or three Icelandic players at a time in some attacking scenarios, but even then, his dribbling/passing/shooting options were limited. This was primarily down to two reasons. The first was the extremely compact and central-orientated Iceland defence, meaning their players didn’t have to cover large distances to close Messi down when he received the ball in central positions. The second reason was a lack of optimal off-ball movement by Messi’s teammates when he had the ball. They often didn’t move much at all when Messi dribbled at Iceland’s defence, and when they did, their movements didn’t drag any defenders away from Messi, nor did they move into positions to offer Messi any progressive passing options. Moreover, Messi commonly executed a somewhat signature diagonal run of his from the right half space across the pitch to the left side of the penalty area, as a response to the progression of attacks down the left wing, although he rarely received the ball after making this run because of the proximity and compactness of Iceland’s defence in orientation to Messi. In deeper areas of the pitch, when Mascherano dropped from the right #6 position to split the two centre-backs, either Meza or Messi would drop into the right central-midfield position, with the other in a slightly more advanced position in the right half-space. Biglia on the other hand played in a slightly more advanced position than he has tended to for the national team, moving through the left half-space into attacking-midfield, operating closely behind Aguero. When Biglia carried out this movement, Messi would almost always drop very deep to within 10-15 yards of Argentina’s centre-backs, receiving the ball in the early stages of Argentina’s build-up. Tagliafico tended to operate in the left half-space, particularly when Biglia advanced, with Di-Maria positioned in the wing channel. In the second half, Tagliafico operated in a wider and more advanced position, meaning Di Maria dribbled more directly inside towards Iceland’s goal rather than down the wing. 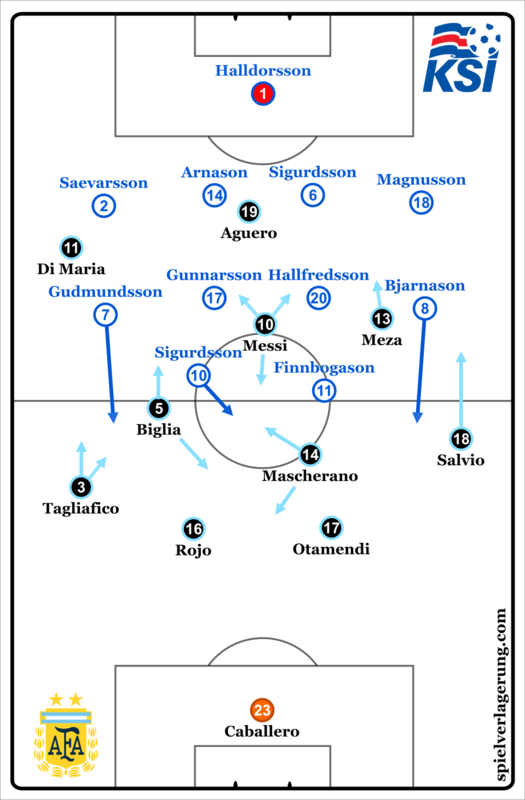 Argentina were forced into wing combinations due to Iceland’s compactness in the centre of the pitch, but their combinations weren’t effective in advancing their attacks into the space behind Iceland’s defence. Pavon was much more direct and punchy than any of Argentina’s wingers after being substituted on for Di-Maria, and posed a much bigger threat to Iceland’s defence than any of Argentina’s other wingers during his short period of time on the pitch. Argentina may have been more successful in creating goal-scoring chances if Pavon played a larger role in this match. Argentina never looked comfortable defensively, with loose balls in their penalty area being a particular issue and cause of disorganisation. This is despite there only being a small amount of loose balls for Argentina to deal with as a result of Iceland’s limited attack. The first key loose ball scenario was created by Rojo’s inaccurate passing (one of his weakest attributes), with the second arising after Argentina were unable to clear an Iceland cross, leading to their equalising goal. Defensively, Icelandic players swarmed Argentina’s players on the ball in central positions. When one player decided to move out of their defensive structure and press the player on the ball, this triggered a player one position away to fill in behind them in order to maintain compactness. This made it extremely difficult for Argentina to create quality goal-scoring chances on a frequent basis. Ultimately, Messi’s missed penalty cost Argentina three points. They should however have been given a second penalty after a foul on Pavon, but the referee wrongly failed to consult VAR and overturn his decision not to award the penalty. Nevertheless, if Argentina lose to Croatia in their next match, they may find themselves in a position where they need luck on their side to qualify for the knockout stages, especially if Iceland get a good result against Nigeria, who could remarkably find themselves in a position where they can have an eye on reaching the last-sixteen. The ‘hipster match’ of the day saw Peru face off against Denmark, with the South Americans making their first World Cup appearance in 36 years. Ricardo Gareca’s side have received a great deal of praise for their high-octane, combination-based style, while the Danes possess an interesting squad led by talisman Christian Eriksen with some effective strategic quirks. 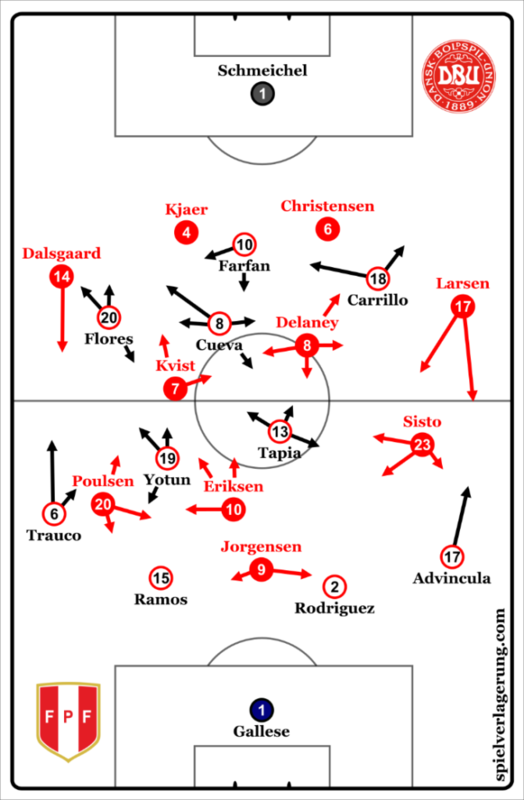 Despite Christian Eriksen being Denmark’s undisputed star, their initial play suited RB Leipzig’s Yussuf Poulsen’s game far better. Playing on the right wing in their 4-2-3-1, the powerful forward enjoyed an aerial advantage over the considerably shorter Peruvian left back, Miguel Trauco. As such, direct play to him from the defensive line and goalkeeper had predominantly positive results. That is not to say, however, that Denmark simply resorted to long balls when faced with pressure in the early stages of their build-up play. Through effective supporting movement from Eriksen, and well-coordinated movements to reduce Peru’s cover of the area in front of the back four, Denmark could establish controlled possession in large spaces between the lines via this route. As EA covered in his excellent team preview of the Danes, Christian Eriksen is exceptional in both securing and progressing possession for his team in these chaotic, unorganised phases. His ability to quickly move the ball away from hugely dynamic and high-pressure areas gives his teammates around him considerably more time on the ball, often in advantageous positions. The intrigue around Denmark’s tactical approach does not end there, however. By taking advantage of the slight central man-orientations and manipulability of Peru’s 4-4-2 defensive structure, Age Hareide’s men showed signs of being able to break down deeper blocks, particularly through their wing rotations. Through these customary positional rotations on the left flank, Denmark can flexibly adopt any number of different structures to suit the situation and their opponent. Against Peru, with their well-defined 4-4-2 block, their most successful moments came when pulling Yoshimar Yotun or Renato Tapia away from their central midfield positions, and overloading the space behind them while doing so. To this end, some variations of the ‘Danish swirl’ proved more useful than others. Thomas Delaney dropping beside Andreas Christensen to form a situational back three, with Pione Sisto pushing into an advanced position in the left halfspace while Jens Stryger Larsen moved as a left winger was one such variation. Alternatively, Sisto occasionally exchanged positions with Larsen, but the Udinese left back’s ability to position himself in passing lanes did not appear to be as strong as his compatriot’s, leading to some stagnant situations on the flank. Denmark’s flank rotation pushes them to lopsided variant of a 3-1-4-2 structure, with Kvist as the pivot. With the Danish back three able to find Kvist through different angles, Peru have an access problem. Yotun attempts to solve this by pushing up on the six, yet does so at the risk of leaving Christian Eriksen completely free high in the right halfspace. Similarly, Carrillo is pinned by the threat of an advancing Dalsgaard combining with Poulsen in the air, rendering him unable to help. Despite the promise of finding Eriksen or Sisto free in advanced areas, such moments were hard to come by. Poor spacing and staggering in the first line, combined with some instances of miscoordination once a gap had been created, meant that central service was often too rushed to be of any use. However, thanks to their right-sided overloads and the complementary movements of Poulsen and Jorgensen, they could break through here to some degree of success. Peru’s combination play is made even more impressive by where it typically takes place. Such is the rhythm of their build-up that they often burst through with combinations along a narrow slither of the flank. This is possible for a number of reasons. The heavy tilting of players towards the flank helps create the impromptu structures needed to keep the ball under such pressure. Christian Cueva was particularly active in creating these small overloads on the side of the ball to aid in sharp combination play. Additionally, with a strong presence in these areas, there is good enough coverage to pick up on loose balls, deflections, and poor touches, thus turning ‘mistakes’ into parts of the combination play, as well as the counterpressing implications. Furthermore, the strikers help create the advancing space required for such forward-flowing play. By threatening the defensive line with runs into depth, they can force the opponent to drop, or else run the risk of being caught out with a ball in behind. As the defensive line moves back, the ball can be brought forwards in the space they leave behind. By playing centrally first, Yotun gives more time and space to his fullback later. Going straight to the left back would bring the pressing players to him as the ball arrived, making it difficult for him to have any positive impact thereafter. The threats posed by Peru’s style of play stretch beyond wing breakthroughs. When their intricate combination play is brought into more central areas, the response from the Danes was to narrow and close in around these spaces. As such, by first playing into the centre, Peru greatly improved the situation in which their advancing fullbacks received the ball, with the opponents who would have just pressed them straight away being drawn in the other direction first, facing the wrong way. Indeed, it was through a combination of flank combinations, and this dynamic advantage for advancing fullbacks that Peru earned their penalty. As Cueva dribbled infield after a quick interchange on the flank, pulling Delaney away from the centre, the Peruvian playmaker exchanged passes with Edison Flores – playing substitute Lasse Schone out of the game. Worried about a pass to Carrillo, Larsen narrows in, adjusting his body position to prepare to press the winger or cut out a through ball. Instead, the ball is allowed to run to the advancing Advincula, out of sight for all the Danish defenders on that side, who returns the ball again to Cueva, who draws the foul. Moreover, the threat posed by Peru’s combination play opened the same avenue that proved so effective for Denmark. With the Danish midfielders pushing up to gain access to Peru’s deep build-up, there were huge spaces between the lines for Peru to play directly into. With narrow wingers and strong occupation of the last line, they were often able to secure possession in these areas, progressing from there. Denmark’s winner, putting them in a strong position in the group, came from the space both teams had enjoyed in their attacking play – behind the opposing midfield as they stepped forwards to press. After Poulsen gave the Danes the lead, this space was readily available for them on the counter attack, as Peru pushed for an equaliser. The introduction of Guerrero provided a larger box presence for crosses, but to no avail. Despite the defeat, Peru won the hearts of many neutrals with their brave and exciting style of play. Australia and France will prove tough opponents, but having seen how both teams fared in the earlier match, it is not outwith the realms of possibility that Gareca’s men could pick up points in their two remaining group games. France kicked off their World Cup campaign with a win over the Socceroos, but the match was closer than many expected given the gap in player quality between two teams. Due to France’s conservatism in possession, resilience from Australia, and technological intervention, the match was contested for long durations but the underdogs were unable to continue their efforts for the whole 90 mins. Managed by Bert van Marwijk, Austrailia were organized in a midfield press that formed into a well executed low block as the French progressed up the pitch. With a 4-2-3-1 base, the outside midfielders simply dropped in line with the midfielders to form a 4-4-1-1, typically as France moved into Australia’s attacking half and the fullbacks took on higher starting positions. Australia demonstrated great compactness among the defensive and midfield lines, moving quickly to pressure as to not restrict the possibility of Mbappe or Dembele destabilizing them in the form of their dribbling oftentimes. When the block was the its deepest, at points there was more than five or ten meters between the two banks of four. This severely congested the targeted space for Antoine Griezmann’s movements, frustrating the Atletico star and preventing him from being the focus of France’s attack. Jedinak and Mooy were option oriented in how they covered France’s attacking trio, maintaining spots where they could access both of them whilst having the players to the side of him. The compactness also enable the Aussies to apply pressure to the ball quickly when France played into the front three while they were tucked inside. With the ball, Australia were able to play through France’s midfield quite nicely at times. Trent Sainsbury, one of the best attacking centre backs in the world, used his great passing and forward dribbling to direct the ball to Tom Rogic and Leckie. Australia’s attack was coped with by France’s individual quality, but showed glimpses that make them an entertaining watch for their upcoming matches against Peru and Denmark. Or was it French Failures? France were incredibly lethargic and slow at times with their play in possession for a multitude of reasons. First, as we mentioned in our preview of France, they frequently have their central midfielders drop closer to the centre backs in possession. While this adds stability to France’s exploits, it doesn’t solve much when their opponents put nine players behind the ball. Linked with this lack of adventurous positioning was their actual choices behind their passes. To avoid losing possession, they simply stopped passing into the tight areas. Pavard and Lucas Hernandez hardly passed forward after a certain point, either dribbling or cycling around the backs instead. This led to more disillusionment from Griezmann, Mbappe, and Dembele. Dembele began to move wider toward the left to open space for himself, with the other two staying central. The preconception going into the match was that the front three would interchange frequently with each other and combine as they move forward. France has really never played like this in the run up toward the tournament. Yet, the lack of combination and interplay among the front three was startling, each of them working individually through long dribbling sequences rather than as a unit in combination. 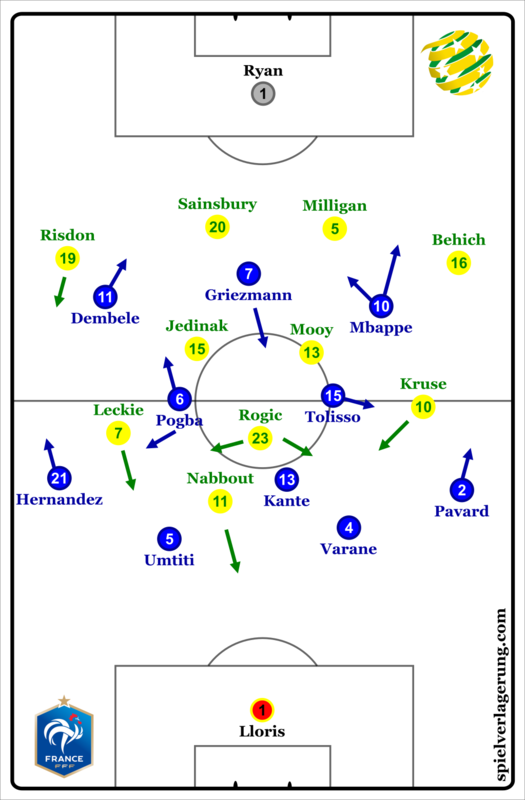 A breakthrough for France came from their main bright point as a team: counterattacking. Paul Pogba threaded a fantastic pass through for Griezmann, who was awarded a penalty thanks to VAR which he convereted. But the French were back to square one after only five minutes, with Umtiti conceding a comically bad penalty kick for Australia to even the score. Olivier Giroud and Nabil Fekir were introduced, with Mbappe being the only remnant of the starting attackers. With Giroud in as the main central presence, combination play improved thorugh the centre, as there was a dependable option there finally. In addition, his ability to bring down difficult long balls from wide was a huge asset in creating chances for Mbappe. Mbappe, more towards the left at this point, had more room between the lines now that the centre backs had to handle Giroud. With Pogba and Mbappe looking to link with Giroud, the attacking dynamic improved, with the best sequence ending in Pogba’s match winner. An unconvincing start for the French, but they managed to secure three points. They will hope to dust off the cobwebs and put together something more cohesive and attacking in the coming matches, as their struggles against low defensive blocks continued.